Neha Kakkar Top 10 Songs Nov 2018 – Bollywood Movies and Punjabi Album Video Songs with Lyrics. Watch all latest hit new movies and album soundtrack. Nikle Currant Song is a Punjabi Album Soundtrack. The Star cast of this Latest music video is Neha Kakkar and Jassie Gill. They both are the Singers. Lyrics are written by Jaani. Sukh-E Musical Doctorz is the Music Director. La La La Song is from the Bollywood Hindi Movie Baazaar. It is starring Saif Ali Khan, Radhika Apte, Chitrangda Singh and Rohan Mehra. The Singers are Neha Kakar and Bilal Saeed. The Lyricist and Music Composer of this song is Bilal Saeed. Dholida Song is from the Film Loveyatri 2018. It is featuring Aayush Sharma and Warina Hussain. Udit Narayan, Neha Kakkar, Palak Muchchal and Raja Hassan are the Singers. The Lyrics are written by Shabbir Ahmed. Tanishk Bagchi is the Music Director. Zindagi Mil Jayegi is an album song. The Star cast of this new video is Neha Kakkar and Tony Kakkar. They both are the Singers. Tony Kakkar has penned down the Lyrics and Composed the Music as well. Morni Banke Song is starring Ayushmann Khurrana, Sanya Malhotra, Gajraj Rao and Neena Gupta in lead role from the Hindi Film Badhaai Ho. The Singers are Neha Kakar and Guru Randhawa. Mellow D is the Lyricist. Tanishk Bagchi is the Music Director of this latest Bollywood song. Dilbar Song is from the Hindi Movie Satyameva Jayate. It is featuring Nora Fatehi and John Abraham. Neha Kakkar, Dhvani Bhanushali and Ikka are the Singers. Shabbir Ahmed and Ikka have written the lyrics of song. Tanishk Bagchi has recreated the Music. Nain Na Jodeen Song is from the Latest Bollywood film Badhaai Ho. The Star cast of this latest music video is Ayushmann Khurrana and Sanya Malhotra. Director of this movie is Amit Ravindernath Sharma. The Singers are Neha Kakkar, Ayushmann Khurrana and Rochak Kohli of this soundtrack. The Music Director is Rochak Kohli. Lyrics are written by Kumaar. Aashiq Banaya Aapne Song is from the Bollywood Hindi movie Hate Story 4. It is starring Urvashi Rautela and Karan Wahi. Neha Kakkar and Himesh Reshammiya are the Singers. Manoj Muntashir is the Lyricist. Tanishk Bagchi is the Music Composer. Camray Waleya is an Album song. It is featuring Neha Kakkar and Tony Kakkar, they both have sung this song. The Music Director and lyricist is Tony Kakkar. Chhote chhote Peg Song is Bollywood film Sonu Ke Titu Ki Sweety. The Star cast of this video is Kartik Aaryan, Nushrat Bharucha and Sunny Singh. Neha Kakkar, Yo Yo Honey Singh and Navraj Hans are the Singers. The Music Composer and lyricist is Yo Yo Honey Singh. Our expert has created this Top Ten list on the bases of responses. 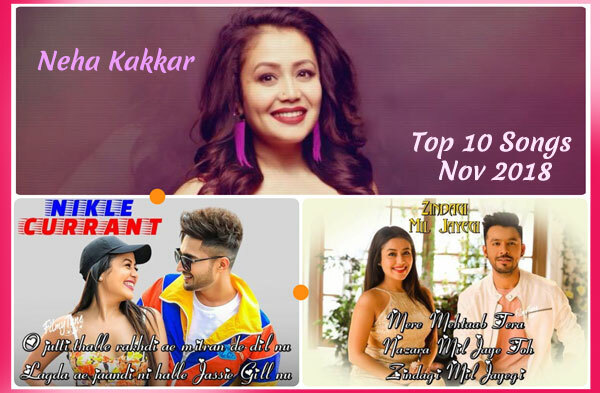 Kindly share your view to improve Neha Kakkar Top 10 Songs Nov 2018 list. We are trying to serve you better.